I have added profiles for all the wrestlers above, you can click on their names to go straight to it. Some wrestlers had double duty on this event as GAEA Japan was still in the process of fleshing out their roster. You may not know some of these names, but you probably know the wrestlers. Tomoko Kuzumi is better known as Azumi Hyuga, one of the top wrestlers in the history of JWP. Here she was just starting out there, having debuted in 1994. On the other side, Yasuko Kuragaki is known today as Tsubasa Kuragaki, she is still an active Freelancer on the scene. 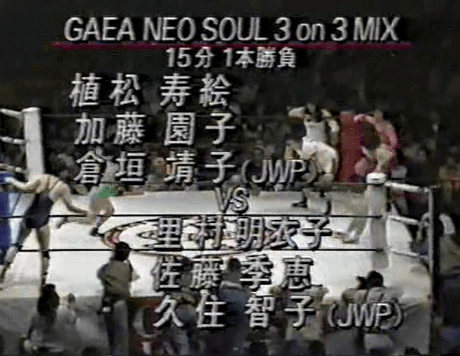 Meiko, both Toshie’s, and Sonoko were all GAEA rookies in their second career matches here, but everyone was relatively inexperienced so its a fair pairing. We join this in progress, with Meiko taking it to Uematsu with shoulderblocks. Snapmares by Meiko and she applies the cross armbreaker, but Kato quickly breaks it up. Meiko tags in Sato while Kuragaki also tags in, Sato repeatedly shoulderblocks Kuragaki to the mat before tagging Meiko back in. Dropkicks by Meiko and she twists Kuragaki’s arm, but Kuragaki reverses it and tags in Kato. Slap by Kato and she goes for a cross armbreaker, but Sato breaks it up. Kato goes for an armdrag but Meiko reverses it into a cross armbreaker, Kato gets to the ropes but Meiko hits mounted punches before tagging in Sato. Face crusher by Sato to Kato and she hits a second one, covering her for two. Kato manages to hit a pair of bulldogs and tags in Uematsu, diving crossbody by Uematsu but Kuzumi breaks it up. Sato hits a neckbreaker and tags in Kuzumi, schoolboy by Uematsu and she dropkicks Kuzumi to the mat. Kuzumi gets the schoolboy applied the next time, she gets on the second rope but is knocked back into the mat. She tags in Meiko, Meiko clubs everyone but is tripped from the floor. Kato comes in but so does Sato and Kuzumi, evening things up. Kuragaki knees Meiko from the apron, she clears their opponents off the apron while Uematsu connects with a diving crossbody onto Meiko for the three count! Toshie Uematsu, Yasuko Kuragaki, and Sonoko Kato win! Only about a third of the match was shown, but it wasn’t bad for a rookie match. Some miscommunications, but remember that for four of them this was their second ever match and first tag team match, so some issues were bound to creep up. Interesting to watch just knowing how big of stars they would later become, but not a very good match. An LLPW Invasion, as Chigusa Nagayo continues getting help from old friends/enemies to fill up GAEA Japan cards. Eagle Sawai was the Ace of LLPW, giving her some big opportunities in her career even though LLPW was a clear 3rd during the early 90s behind AJW and JWP. Keiko Aono, who still wrestles today in Diana, debuted just a few months prior so she was an even match for Meiko, who was pulling double duty here after being in the opener (she wasn’t in back to back matches, the middle of the card just wasn’t aired). Meiko teams with the leader of GAEA Japan, as Chigusa Nagayo takes a bit of a step back in the second event to let other wrestlers have the spotlight. After the pre-match handshake, Keiko nicely goes out to the apron while Eagle attacks both of her opponents from behind. Eagle grabs Nagayo and bits a bodyblock, but Nagayo doesn’t go down. Nagayo’s heel kick has the same effect, both wrestlers go for lariats and they knock each other to the mat. The rookies come into the ring to help, Meiko stays in with Eagle and goes for dropkicks, but she can’t knock Eagle over. Eagle slaps Meiko in the chest and hits a bodyblock, she picks up Meiko and hits a scoop slam before tagging in Keiko. Back elbow by Keiko and she hits a bodyslam, she covers Meiko but it gets two. Irish whip by Keiko but Meiko hits a few shoulderblocks, she throws down Keiko by the hair and hits an elbow in the corner. More elbows by Meiko while Nagayo cheers her on, but Keiko switches positions with her and hits her own elbows. Keiko asks for a tag but Eagle isn’t interested, Meiko Irish whips Keiko and hits a few more jumping shoulderblocks. She asks for a tag but Nagayo wants her to stay in too, she shoulderblocks Keiko again and tries to tag Nagayo again, but Nagayo refuses. Note the crowd is cheering this, it is not Nagayo being mean but rather wanting the rookie to get experience and fight. Keiko comes back with her own shoulderblock and finally Nagayo allows Meiko to tag her, Keiko elbows Nagayo into the corner and dropkicks her to the mat. Dropkick by Keiko and a hard shoulderblock, she covers Nagayo but it only gets two. Nagayo finally plants Keiko with a high kick, more kicks by Nagayo and she covers Keiko for two. Irish whip by Nagayo and she delivers a spinning heel kick, she picks up Keiko and tosses her into her own corner so Eagle can come in. Nagayo goes for a sleeper but Eagle drives her back into the corner, Eagle then goes for a powerbomb but Nagayo reverses it with a back bodydrop. Nagayo tags in Meiko, dropkicks by Meiko and she goes for the cross armbreaker, but Eagle grabs the ropes to block it. Meiko tries to knock Eagle over and eventually half succeeds, but Eagle knocks her back to the mat. The crowd is really getting behind Meiko as she tries to knock over Eagle, but she can’t get Eagle completely off her feet. Meiko is pretty gassed at this point as Eagle scoop slams her in front of the corner and tags in Keiko, scoop slam by Keiko and she covers Meiko for two. Dropkicks by Keiko and she coop slams Meiko, but Meiko bridges out of the pin. Meiko goes off the ropes and hits a couple shoulderblocks, she applies the cross armbreaker and Keiko quickly submits! Chigusa Nagayo and Meiko Satomura are the winners. It is time for the main event, which partially follows the pattern from the last match as the veteran GAEA Japan wrestler KAORU teams with the rookie Sonoko Kato to help push her along. Miki and Michiko both represent LLPW and are no rookies, both started their careers in the late 80s so they have a big edge on Kato. Neither Miki nor Michiko had a lot of success in LLPW however and were mostly midcarders with an occasional tag title run, so its not quite as lopsided as it may look on paper. Nagashima and Handa attack before the match starts and they immediately take the match out to the floor. 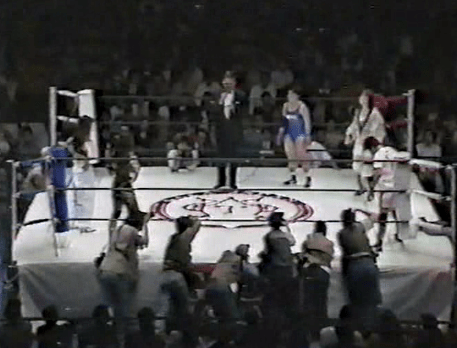 Kato is tosses into various objects before Nagashima brings her back into the ring and tags in Handa. Handa tosses around Kato while preventing her from tagging in KAORU, Nagashima returns and they double team Kato in the ropes. Kato is beaten around the ring and generally treated like a low ranked rookie for several minutes, until she finally gets close enough to her corner and tags in KAORU. KAORU tosses Nagashima around the ring and stomps her down in the corner, Handa runs in to help her partner but KAORU dispatches her and gets back to Nagashima. Vertical suplex by KAORU, but the cover gets two. KAORU applies a chinlock and then a bodyscissors, but Nagashima gets out of it. KAORU slaps Nagashima and tags in Kato, dropkicks by Kato but Nagashima kicks her and tags in Handa. Handa tosses Kato in her corner so that KAORU can tag in, jumping neck drop by Handa and she tosses KAORU to the mat. Handa goes for KAORU’s leg but KAORU gets into the mat, Handa tags in Nagashima and Nagashima stays on the offense, as now KAORU is the Face in Peril. Handa returns and hits a diving crossbody on KAORU, but KAORU finally manages to roll up Handa and tags in Kato. Double dropkick to Handa and Kato hits a scoop slam, swandive body press by KAORU and Kato tosses around Handa by the hair. Dropkicks by Kato but Handa punches her and hits an elbow to the back of the head. Vertical suplex by Handa, but the cover to Kato gets two. Handa tags in Nagashima, who dropkicks Kato in the face. Kato rolls out of the ring but KAORU hits Nagashima with a missile dropkick, she tosses Nagashima out of the ring but Handa sails in with a missile dropkick of her own. KAORU dumps Handa out of the ring and goes off the ropes, but Nagashima trips her from the floor and pulls KAORU out with her. KAORU is hit with chairs by both of her opponents, KAORU and Handa go up into the stands while Nagashima kicks Kato in the ring. Handa returns first and helps Nagashima double team Kato, who by this point is busted open. KAORU finally returns and tries to help Kato, but is kicked in the back of the head for her trouble and hit with a double neck drop. Nagashima goes up top but misses the missile dropkick on Kato, bulldog by Kato and she hits a second one for a two count. Kato slams Nagashima in front of the corner and tags in KAORU, who hits a moonsault onto Nagashima for two. She goes up top again but Nagashima rolls out of the way of the second moonsault attempt, KAORU lands on he feet but is hit from behind by Handa. Nagashima gets a kendo stick and hits KAORU with it, but KAORU knocks it away from her. The only way to really give a final review of a one hour show is to note if there is anything ‘must see’ presented. There wasn’t here – we saw some growth with the rookies in their second matches but that is about it. The live crowd saw a lot more wrestling of course, but as it was presented to us, a pretty skippable show.